Big Bear Bicycle MTB Shops / Rentals - Big Bear Mountain Biking Trail Guide Maps GPS - Hiking Trails too! 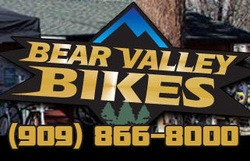 Bear Valley Bikes - The oldest bike shop in Big Bear! Rider / Racer / MTB Hall of Famer owned!